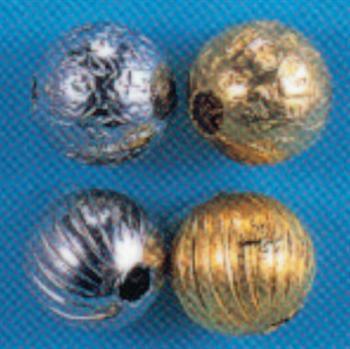 Quality hollow beads made of Solid Brass. Available in Brass or Nickel-plate finish. Available in two styles. SPIRAL STYLE - is a finely fluted bead with spiral flutes throughout its sphere. HAMMERED STYLE - is a bead hammered to give the effect of small carved figures.